Back in March, the Trump administration released its “skinny” budget. The skinny budget laid out the administration’s priorities for the next two years of discretionary spending. This skinny budget made absolutely disastrous cuts to nondefense discretionary (NDD) spending. This matters to most Americans because the NDD portion of the budget is where the vast majority of public investment is funded. NDD spending is already on an extraordinarily austere path under current law. The Congressional Budget Office (CBO) estimates that by 2027 NDD budget authority as a percentage of GDP will fall by one-fifth, reaching a historic low of 2.4 percent. Trump’s skinny budget wanted us to get to this anemic level by next year. And the details of the recently released full ten-year budget are far worse. The Trump administration’s budget would cut NDD budget authority as a percentage of GDP by 56 percent, slashing it to an unprecedented 1.4 percent of GDP by 2027. CBO estimates that NDD spending will account for just 13 percent of all federal spending over the next ten years, but half of it is public investment. The full Trump budget would be an unprecedented disaster for public investment. 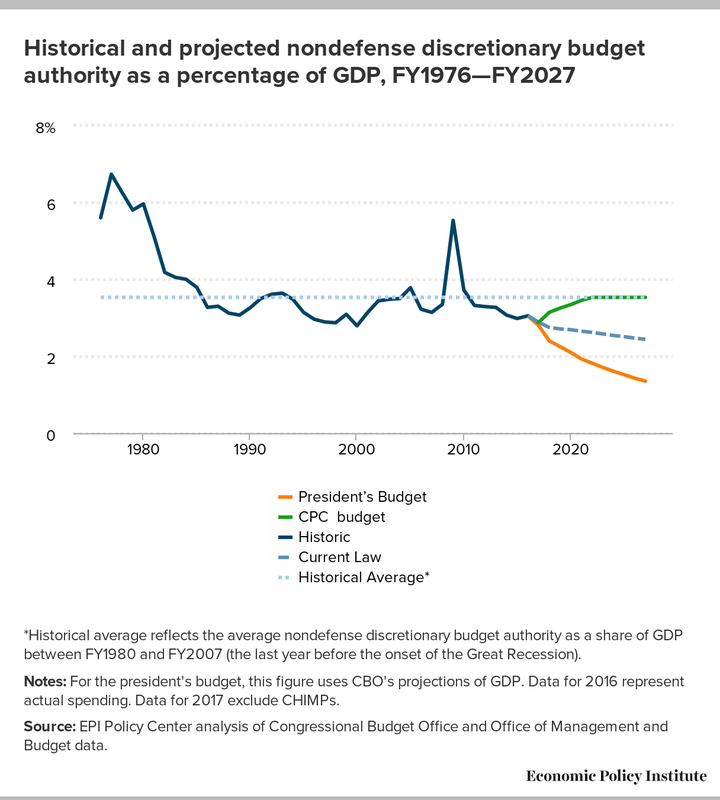 *Historical average reflects the average nondefense discretionary budget authority as a share of GDP between FY1980 and FY2007 (the last year before the onset of the Great Recession). Notes: For the president's budget, this figure uses CBO's projections of GDP. Data for 2016 represent actual spending. Data for 2017 exclude CHIMPs. Source: EPI Policy Center analysis of Congressional Budget Office and Office of Management and Budget data. This highlights the enormous gap between Trump administration rhetoric about boosting infrastructure investment and the reality of their policies. Trump campaigned on a $1 trillion infrastructure proposal, but has never backed this up with a real plan. First, the campaign’s original plan was simply not serious, and would not have led to anywhere near $1 trillion in net new investment forthcoming. Next, the skinny budget cut the Department of Transportation by 13 percent. And these are not just cuts to some abstract bureaucracy, included are cuts to actual infrastructure funding. About 21 percent of those cuts come from ending the TIGER discretionary grants program that fund state-level infrastructure projects. And the details of the Trump administration’s full budget were far worse. Using boilerplate claims to “leverage the private sector” for the rest of the $1 trillion, the administration only offered an increase of $200 billion in short term (the extra funding ends by fiscal year 2027) federal investment in infrastructure. But “leveraging the private sector” does not create infrastructure from thin air, it just means state taxpayers and infrastructure users are on the hook for the other $800 billion. And behind this short term increase in funding is an awful trade for the American public. The administration’s budget would choke off the major dedicated source of federal surface transportation infrastructure investment—the Highway Trust Fund (HTF). The federal gas tax which funds the HTF hasn’t been increased since 1993, slowly draining the purchasing power of the HTF’s dedicated revenue source. To cover the gap between HTF project funding and the decaying value of its revenue source, Congress has continually kicked the can down the road by using general revenues to pay for the difference instead of raising the gas tax (or finding a new dedicated revenue source). Trump’s budget would permanently stop covering the shortfall without raising a new revenue source. In the next decade, this is a cut of $139 billion in surface transportation infrastructure investment—and it’s a cut that would grow worse after that. Trump’s infrastructure plan was supposed to cover much more than just surface transportation infrastructure. But even if Trump were just offering this as a plan for surface transportation infrastructure, the American public would be getting a raw deal. American households would be trading a short term boost of just $61 billion in federal investment in return for gutting the major source of federal surface transportation infrastructure investment permanently. Over the long run, the Trump budget will offer drastically less federal infrastructure investment. In recent years, productivity growth has been worryingly decelerating, associated with a steep decline in growth of the nation’s capital stock. The labor market still has slack, and while the Federal Reserve has begun to raise rates, their ability to counteract the fiscal drag this budget could cause is highly uncertain. Effectively, the American economy needs the exact opposite of what the Trump budget provides for infrastructure. This means that what the U.S. economy could really use is the budget put forth by the Congressional Progressive Caucus (CPC). The CPC budget provides a stark contrast to the damaging cuts of the Trump budget. Instead of imposing a fiscal drag on the economy, the CPC budget would provide the fiscal boost necessary to push the economy back to genuine full employment. Instead of slashing public investment with deep cuts to NDD budget authority, the CPC budget would return it to its historical average of 3.5 percent by fiscal year 2022. And the CPC budget, unlike the Trump budget, doesn’t pretend to offer a substantial increase in federal infrastructure investment while actually proposing to gut the HTF and leave state taxpayers and infrastructure users to pick up 80 percent of the tab for any theoretical increase in investment. The CPC budget includes $2 trillion in increased federal infrastructure funding with no games or gimmicks. As the Trump administration touts “infrastructure week” in coming days, remember the old adage: “Show me your budget, and I’ll tell you what you value”. Based on their respective budgets, the Trump administration does not value infrastructure investment, but the Congressional Progressive Caucus does.